The Planning Commission's approach draft for the 11th Five-Year Plan has raised concerns regarding the environmental and socio-economic impacts of the ongoing jatropha plantations for developing bio-diesel in various parts of the country. The report says being a water-intensive crop jatropha plantations could lead to a drinking water shortage, and encroach on pastoral lands and animal habitats. The report has come as a surprise since the commission was the first to persuade the Centre, in April 2003, to take up large-scale jatropha plantations under a national mission programme on biodiesel, to achieve a country-wide 20 per cent blend in diesel by 2010. Jatropha plantations were initially planned for eight states led by Chhattisgarh. The programme is yet to be launched officially but most of these states have already taken up jatropha plantations under it. The national biodiesel programme got off to a wrong start with three ministries -- the Union ministries of petroleum and natural gas, rural development and environment and forests -- and a number of state governments being embroiled in the process. And the Union ministry of agriculture was completely sidelined. Land-grabbers' haven "The land-mafia and large corporations are using the jatropha-hype created by the government to grab vast stretches of forest and pastoral land," says Ashok Pradhan, a social worker based in Bilaspur, Chhattisgarh. The Chhattisgarh government has promised 200,000 hectares (ha) to some of the country's largest private and public sector companies like Reliance, Emami, Kitply, Indian Oil, Indian Railways. The state aims to increase the land lease for jatropha cultivation to 300,000 ha by 2007. According to media reports, this mad rush for land has led to clashes in which at least 30 people lost their lives in Bilaspur, Raipur, Ambikapur and Jagdalpur districts of Chhattisgarh that are considered the most lucrative destinations for jatropha plantations. The victims are mostly poor farmers of Chhattisgarh. They are fighting to protect their land from the rich Haryana and Punjab farmers who are eyeing the lucrative bio-diesel business. And with the state government promising to lease a hectare of land at only Rs 100, there is no saving grace. Whose land? 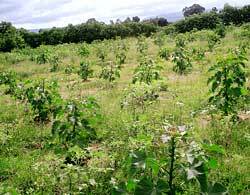 The mission had proposed an area of 11 million ha under jatropha cultivation by 2012. For this purpose, 17.4 million ha of wasteland were identified in the country (see graph Barren bounty). But it's not that simple. Degraded forest lands in most states are occupied by a number of forest dwellers and village folk. "It won't be easy for the government to lease out land so easily since the livelihood of people depends on it. Local politics has made the situation worse in states like Chhattisgarh, Maharashtra and Andhra Pradesh," says Abhishek Maharishi, chief executive of the ngo Centre for Jatropha Promotion. The rationale behind the jatropha plantation programme has been questioned with the land required -- 11 million ha -- being almost 7 per cent of the cultivable area in the country including the wastelands. This area is more than the country's area under cotton and half the area under wheat cultivation. The aggressive push for jatropha cultivation is sidelining many coarse cereals and other food crops that can grow in wastelands. "The country is facing a massive shortage of edible oil. We imported edible oil worth us $9 billion last year. Why can't we grow hardy sources of edible oil, like groundnut, in those regions," says Sanjay Agarwal, an agricultural commodity trader based in New Delhi. The mad rush for jatropha has been brought about by a rise in crude oil prices that have increased by almost 300 per cent in the last two years. With the European Union making bio-diesel blending compulsory, new business interests have come up, says Maharishi. India's wastelands have been compared with Malaysia and Indonesia's plantations done on wastelands but we cannot forget that India has a large population dependent on this land for livelihood and food. Experts have questioned the mission's emphasis on jatropha cultivation, even though other indigenous species like pongamia (karanj) are also available. The justification jatropha being a perennial and sturdy shrub grew well on marginal land. It is drought and disease-resistant and its seeds contain about 30 per cent oil that can be used for bio-diesel production. It is estimated that six years after initial sowing, each hectare of plantation will annually yield seeds sufficient to produce 2.5 tonnes of bio-diesel. Jatropha is considered best for dry tracts facing acute scarcity of water. But for commercial cultivation an average seed yield of 5 tonne/ha is required that will need irrigation, pruning, fertilisation and sufficient sun exposure. Jatropha cultivation requires a minimum rainfall of 600 mm and also needs proper irrigation systems in dry tracts where rainfall varies from 400 to 600 mm. Experts explain that jatropha can withstand drought and can survive for two or three years by shedding its leaves. "Jatropha does not have deep roots and so requires a high water table. Thus, it draws the soil moisture and competes with the other food crops," says Maharishi. "While pongamia draws water at a depth of 10 metre and does not use up all the water," he adds. Pankaj Oudhia, an agriculture scientist, also agrees "Jatropha competes with other food and forest crops for land, water and nutrients and affects the cropping system and agro-biodiversity." But some argue against this (see interview Faltering mission). The Nicaraguan example is often cited as an example for high yields of jatropha. But Nicaragua has much higher rainfall (1,700 mm) than the average precipitation in India (1,100 mm), which is unevenly distributed. African countries are even undertaking a hydrological investigation to determine the potential impact of jatropha cultivation. "Jatropha does not fit into afforestation efforts, which combine jatropha with other higher growing forestry tree crops," says Oudhia. "Taller trees stunt the jatropha's growth," he adds. With the government's promotion of jatropha, its production is expected to increase through monoculture. But scientists are apprehensive that large-scale jatropha cultivation will harm biodiversity in the long run. "Monoculture plantation has affected the local biodiversity. Mechanical tilling destroys the existing vegetation and fauna," says Farida Tampal, Andhra Pradesh state director for the World Wide Fund for Nature. Mixed cultivation is a better choice, he adds. The question is What constitutes "marginal" and "wasteland" and who are the real beneficiaries of the bio-diesel produced, let alone the environmental costs that have not been accounted for. A senior planning commission official says despite some obvious benefits of jatropha-based bio-diesel, the unscientific and unethical route taken by states and industry have ruined the objective of the mission. If the trend is not checked soon, the programme could result in a social, economic and environmental fiasco.